A rain barrel is a great way to collect and recycle rainwater. Building one is also a simple, straightforward project. With easy to follow instructions, you can get your rain barrel up and running within just a few hours. Make sure you have all of the necessary supplies and material before starting your rain barrel project. A rain barrel at its simplest is 55 gallon container with a hole for water to enter, a screen for filtering out debris, a cover for keeping out mosquitoes and a two valves. As water runs down your roof line and is collected in the gutters, it will travel down the spout and directly into the rain barrel. The strainer basket filters out leaves, the top valve prevents overflow by emptying excess water from the barrel when it reaches this height. The value will siphon off the water and carry it away from the barrel and the house. 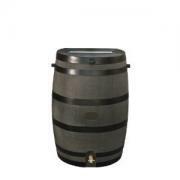 The lower valve allows you to use the collected water in the barrel as needed. Place the skimmer basket upside down on the top of the rain barrel. Use a pencil to trace its outline. Drill a hole in the center of the outline and use this hole as a starting point for the jigsaw. Cut just inside the outlined area, leaving a small rim from which the basket will hang. Insert the basket into the hole so it hangs down securely. Measure and mark 2-inches down from the rim of the barrel and use the spade bit to drill a hole for the upper faucet valve here. Insert the plastic faucet valve, and screw on a coupling from inside the barrel. Use the Teflon tape to wrap the valve on the inside before you attach the coupling to ensure a good seal. Mark and drill a second hole 2-inches from the bottom of the barrel. Insert and attach the second faucet valve. Run a bead of caulk around the outside of each of the faucet valves to prevent leaks and ensure a good seal. Wet your index finger and run it over the caulk, pushing it against the barrel and the faucets. Cut the hose into 2 and 3-foot sections and attach faucet couplers onto each section. Tighten down the screws on each coupler securely. Attach the 2-foot section of hose to the bottom valve and the three foot section of hose to the top valve. Open the top valve to act as an overflow. Place the section of window screen over the opening to the skimmer and position the rain barrel beneath the spout from a gutter. Line up the gutter spout and the top hole in the barrel to collect runoff rainwater. Check your barrel frequently after a storm. Clean out the strainer basket to remove any debris, and double-check that the valves are working properly. To use collected water, run the bottom hose to a portable container and open the bottom valve. Each time you use rainwater to water your lawn, it means you are not using the main water source for your home, which saves you money and conserves water. It's a great way to create a unique energy efficient home. You can use your rainwater for gardening, watering your lawn, laundry and even bathing. Rainwater use also helps the environment not just your home and wallet. Using rainwater naturally puts a renewable resource to double use. Water pollution is cut down when you use a rain barrel since it stops all storm water runoffs that can carry bad pollution like oil, bacteria, grease and trash to the main water sources. Connect a rain barrel to the gutter system in your home and start collecting water for use in and around your home with the very next rainfall. You may be surprised to discover just how useful your rain barrel becomes and may opt for more than one.